I have been dipping my toes into the raw food waters over the past year. Adding more juices and superfood smoothies has been fun and has created a healthier experience, yet I haven’t made the plunge entirely. I most likely will never eat 100% raw, but I would love to reach 70-80%. That seems doable, and with the resources available now, this feels supported. As with any lifestyle change, it can be scary because it will certainly bring up challenges along the way and layers to be shed as we transform into our truer selves. As with any cleanse, physical or spiritual, things arise that aren’t very pleasant. Yet, I am feeling ready and inspired. One thing that makes sense to me about changing our diet is that instead of cutting out things right away, to start adding things. This way we are nurturing ourselves instead of depriving ourselves. At some point, the things we used to want will naturally be replaced by things our body wants. And believe me, eating raw food is not about eating sand paper. The flavors are amazing! They leave the store bought food in the dust! I watched the movie Raw for 30 Days, which I highly recommend. This movie demonstrates the power of raw foods. A 30 day raw food diet changed the lives of people with diabetes. Almost all of them got off their insulin and looked completely different just after a month. The Raw for 30 Days movie also has a bonus dvd which has recipes, interviews and information about raw food by several well known people on the subject, plus a few celebrities that eat raw. It was inspiring and gave me some great food ideas. 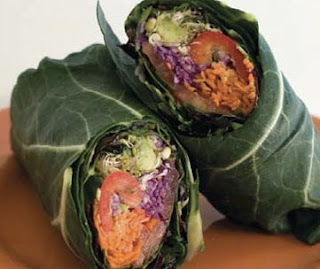 One recipe by Rod Rotondi, who owns a raw restaurant in California called Leaf Cuisine, uses collard greens as a wrap instead of tortillas. I like this especially since we are also eating gluten free. Another idea is to use very thin zucchini overlaying each other as a spring roll wrap, with spiralized jicama, carrots and cilantro. You Tube is full of great information on this subject. There are several raw food channels that openly offer recipes and support. Search for David Wolfe, who inspired my smoothie recipe, which you can find here on my blog. This has been our drink of the day for a few months now and it is really amazing! We replace one meal with this. David talks a lot about superfood and smoothies. He lived on smoothies for three months and still says that he isn’t the type to prepare an elaborate raw meal. He’d rather just throw it all into a blender and go. If you search David Wolfe smoothie, you’ll see his version of a power packed superfood smoothie. You can also search for the renegade health show. This show is done by cute couple who live a raw lifestyle. They share simple raw recipes and health information. They have a great granola recipe and a raw buckwheat cereal recipe. Both of these recipes require sprouting grains and they share the best way to do that. Right now they are living in an RV in Key West and are planing to travel around and help people get healthy. They are fun to watch. The intro music is a bit jarring, so I recommend turning down the volume at the beginning. One great food they introduced me to was kelp noodles. I haven’t tried them yet since I need to order them online, but they are raw and look great as a substitute for pasta. The company that makes them is called Sea Tangle Noodle Company. To go with the noodles, you can make a raw pesto or cheese sauce such as the alfredo recipe here. As for desserts… well, I love this cake. I have made it a few times and it really is delicious. This comes from a blog and has lots of recipes to get us started. Her green juice is also delicious! At this point, you may be asking yourself how you will be able to live without chocolate chip cookies. Well, you don’t have to! I found this recipe the other day and cannot wait to try it! I also have found people on facebook and twitter that are interested in a healthy and raw diet. There is a growing community and I welcome you to join in the fun! Search for raw facebook groups and twitter search raw and you’ll be good to go! As far as books, I recently borrowed Rawsome by Brigitte Mars at my local library which is packed full of recipes, plus has a sprouting chart for accurate times, etc. I will be buying this to keep as a reference. Lastly, you may want to purchase a few kitchen items to assist in this diet. I recommend getting a dehydrator for granola, flax crackers and fruit leather or dried fruit. I recently bought the Nesco for $50. A blender is crucial for smoothies and sauces. Our parents were generous and bought us a BlendTec for Christmas this year, which can blend just about anything. You can also use a regular blender for easy to blend foods. I also recommend a spiralizer, which cuts veggies, like zucchini, sweet potatoes, jicama and other veggies into very thin pasta like pieces. Top this with pesto and you have Italian! And last, but not least, a juicer goes a long way for a raw diet. We have had a Champion Juicer for several years now and it’s still going strong. I love juicing and love the effects of drinking fresh juice. Making juice is a great daily activity (and meditation) and also can be part of a powerful cleanse. I have heard some people complain that it takes too long or it’s hard to clean, but compared to cooking a meal, it really is simple. It takes about 10 minutes from start to finish. I love Jay Kordich’s juicing passion. He used juicing to heal from cancer in his 20’s and has been “eating around his juice” for several years. He is in his 80’s and looks no older than 50. You can connect with him on facebook for inspiration. Well, I hope this gets you inspired to eat healthier and closer to the earth. With all this excitement about healthy food, I am craving some juice right now… happy eating! This entry was posted in The Cornucopia and tagged Raw Food, Recipes, Simple Meals. Bookmark the permalink. Mmmm. That wrap looks so good. Some of the tastiest food I've ever eaten was made by a raw food chef–an expert, mind you. My sweetie has been talking about raw food for a while, but I've been resistant to learn a new discipline. Plus, I like the comfort of hot food. But your suggestion to add a few things, rather than thinking of it as letting go of so much that I love is a good one. I'll give it a try. The diabetes story is a good motivator, too.